DENVER — The winter storm is quickly moving east of Colorado. Skies will be mostly clear overnight with lighter winds and cold temperatures. Temperatures will be quite cold overnight. Lows in the Denver area and across the eastern plains will be in the teens. Gusty winds at times will make it feel like zero to 10 below on exposed skin. In the mountains, lows will range from 10 below to 5 above zero. Snow will return to the northern and central mountains on Wednesday. Highs will be in the 30s in the mountains, with 40s and dry weather on the plains. A Winter Weather Advisory is posted for the central and northern mountains for another 4 to 8 inches of snow. 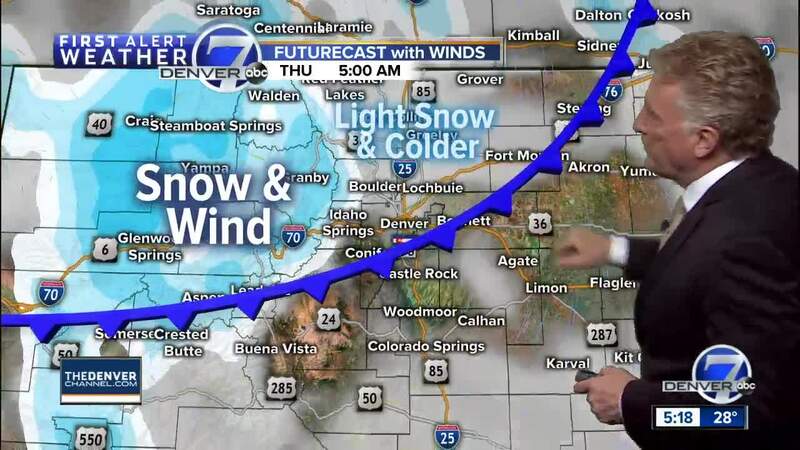 Another cold front will arrive early Thursday with a few more inches of snow for the mountains and light snow for Denver and northeast Colorado. Temperatures will be colder with highs in the 20s in the mountains and 30s on the plains. Denver could see an inch or two of snow, but blizzard conditions will not develop from this next system. Snow totals in the mountains will be 6 to 10 inches from Wednesday afternoon through Thursday - mainly in the central and northern areas. Friday through Sunday should be milder and drier across the state. Highs will reach the low 50s in Denver over the weekend. In the mountains, a few snow showers can be expected, but it will be milder with highs in the low to middle 30s. By Sunday night and Monday, another cold front will arrive with a chance for heavy snow in the mountains and a few inches of snow for Denver.